If you’re busy with lots of client work, it’s easy for things to get out of hand. Don’t let your work get away from you; organize information and projects with these tools. Backpack: Get your projects organized by using Backpack. Create to-do lists, notes, files, images and a calendar with reminders that can be sent via email or to your mobile device. Central Desktop: Collaborate, communicate and share files with clients and coworkers using Central Desktop. iOrganize: With iOrganize, freelancers can organize work by keeping notes, ideas and bookmarks in one place. Viapoint: Viapoint makes it easy for freelancers to store emails and files by client or project. Stikkit: Use Stikkit’s “little yellow notes that think” to keep in touch, plan and collaborate with clients and coworkers. Webnote: Webnote users can take notes using a web browser, then save and return to the notes on any computer. This is especially helpful if you’re working on-site with a client and have to use a computer other than your own. Netvibes: Spend less time searching and more time working by customizing your browser’s start page with email, feeds, messaging, job boards and much, much more. Client meetings, important events and a never-ending list of things to do can wear you down if you can’t make them manageable. Use these handy calendars and to-do lists to keep your schedule from taking over your business. Remember The Milk: Remember The Milk reminds you to take care of important tasks, so you’ll never forget when a project is due. CalendarHub: Use CalendarHub’s web-based calendar to keep track of deadlines and set goals for your business. Google Calendar: Google Calendar is a web based tool that allows users to organize their schedule, so you’ll always know exactly what you need to be working on. Neptune: Neptune’s web based to do list tool helps you keep track of the things you need to take care of every day. It lets you email yourself new tasks, get an email report every morning and upload files to store with your projects. Ta-da List: When you’re busy with lots of projects, it can be hard to keep track of what you’ve accomplished. Make web-based ta-da lists for yourself or other people, then share them and check items off as you go. Money is what keeps your freelance business going, but managing it can be tedious and time consuming. Sure, it’s fun to see money come in, but does anyone really like sending out invoices? Use these tools to make the process of managing your income easier and more enjoyable. InstaCalc: InstaCalc is a web based calculator with lots of bells and whistles including spreadsheet capabilities, unit conversions and programming commands. It’s great for freelancers because you can send clients links to any of your calculations, put a calculator on your website or create charts and graphs from your calculations. XE: If you’re working with an overseas client, you may need to handle foreign currencies. Use XE’s currency converter for accurate calculations with up-to-the-minute currency rates. FreshBooks: FreshBooks offers a program for “painless billing,” so you’ll never have to spend hours sending client invoices out. Designed with service-based businesses in mind, this software provides a method to manage and send invoices, handle work orders and generate reports with ease. Do you have too many client files clogging up your hard drive? Use these services to take a load off. openonmy: openonmy’s website offers storage for files up to 1GB. These files are made to be accessible from any computer, so you can open them up even when on-site with a client. YouSendIt: Have you ever had to clean out your inbox just so you’d have room to send out an email? YouSendIt puts and end to that trouble by sending files up to 2GB to your clients. Flickr: Save space on your hard drive by uploading your photos to Flickr. It’s a great way to store, share and organize photos for your business. Box: Create an online file-sharing location for you and your clients on Box. MediaTemple: Keep your important client files safe on MediaTemple’s servers. They offer innovative hosting solutions for all kinds of websites. DivShare: Use DivShare’s file hosting service to email files to clients or store them in a folder for shared access later. Do you wonder where all of your time goes? Do your clients want frequent status updates? Keep tabs on your time and projects with these tools..
Side Job Track: Side Job Track, designed with freelancers in mind, provides software that lets you track and manage project information. Features include job tracking, invoicing and reporting. ConceptShare: ConceptShare provides online design collaboration. Invite clients and coworkers to view your design and make comments on your work. ProjectStat.us: Instead of fielding constant calls about the status of a project, let your customers view the status of their project online with ProjectStat.us. Being creative can get expensive. Purchasing icons, stock photos, book publishing and the like can add up fast and eat into your profit margin. Check out these free and inexpensive tools designed to make the lives of freelance writers and designers cheaper and easier. Writeboard: Have you ever had a client or coworker revise a document and end up wiping out your work? Use Writeboard to share and collaborate while saving separate versions each step of the way. Lulu: Lulu gives fledgling writers an easy way to get published. Each product is printed as it’s ordered, so you don’t have to build an expensive inventory. MailBuild: Built for web designers, MailBuild allows users to set up a template for client email campaigns. MyFonts: Do you want to see how fonts will look on your design before committing to a purchase? MyFonts provides a source for trying out and buying new fonts. IconBuffet: Find and trade stock icons for your web designs on IconBuffet. stock.xchng: Add photos to your writing or web design at low or no cost. stock.xchng provides tons of stock photos, many of them royalty-free. Google Docs & Spreadsheets: Don’t bother spending hard-earned money for the latest version of MS Word. Create, upload, share and edit word and spreadsheet documents online using Google Docs & Spreadsheets. 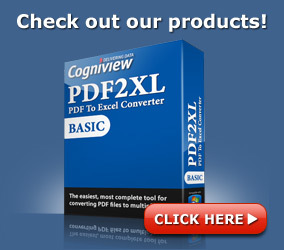 PDF2XL: While not a web app, Cogniview’s PDF to Excel converter can save you mucho tiempo when you are faced with locked PDF data relevant to you business. With this tool you can extract inventory data, pricing and product data and prospects list from PDF file to Excel. MorgueFile: MorgueFile’s high resolution photos are has-beens in the stock photography world, but that doesn’t mean they won’t do a great job spicing up your work. Don’t let your work get stolen or compromised. Can you imagine how your business would suffer if you lost files due to a virus? Or worse, if the financial information of your clients got exposed to spyware? These services help you stay safe and secure. SpamSieve: Fighting spam takes time away from your business and opens your system up to intruders. Use SpamSieve to keep spam out of your Mac email client. Escrow: Don’t get burned by clients that make fraudulent payments. Use Escrow to protect yourself and your clients from payment fraud. Cloudmark Desktop: Cloudmark protects your Outlook inbox from spam, phishing and viruses, so you’ll never have to worry about compromising business files when reading your email. PayPal: Give your clients a way to pay without sharing their financial information by using PayPal. Moneybookers: Open your business to the worldwide market safely. Use Moneybookers for secure worldwide payment and acceptance. Spybot Search & Destroy: Make sure your confidential client information is safe from prying eyes by scanning for spyware with Spybot Search & Destroy. AVG Anti-Virus Free Edition: Protect your business files with a good antivirus program. AVG Anti-Virus offers a free solution for protecting your computer from viruses. When running a business, it’s essential that you’re able to keep in contact with clients, vendors, coworkers and other important acquaintances. Use these tools to communicate with ease. Campfire: Campfire is a web-based chat tool that’s ideal for online meetings with clients or coworkers. FaxZERO: Online communication is popular, but sometimes you just have to send a fax. But who wants to invest in a fax machine and phone line for something that happens only on a rare occasion? Instead, use FaxZERO to send a fax anywhere in the US or Canada for free. eBuddy: Don’t miss out on important messages while you’re away from your base of operations. Log on to eBuddy to sign on to online messengers using your mobile device. K7: FaxZERO lets you send out a fax for free online, but what if a client wants to fax something to you? Enlist the help of K7, a service that assigns users a phone number that accepts fax and voicemail messages, which are then sent to your email. GoToMeeting: Use GoToMeeting to keep in touch with clients and coworkers via online meetings. LogMeIn: Don’t let your business suffer because you can’t take your computer on the road. Use LogMeIn to get access to your computer’s desktop anywhere. You provide a great service and offer awesome rates, so why isn’t the world knocking down your door with business? Perhaps it’s because they have no idea you exist. Get your name out there and find new clients with these tools. LinkedIn: LinkedIn offers online networking at its best. Find opportunities and contacts based on your work and the people you already know. askCHARITY: Take advantage of askCHARITY’s database of key media contacts to get the word out about your business. Craigslist: Craigslist is an invaluable tool for any freelancer. Find clients, sell your work, buy supplies, network and more using Craigslist. Coroflot: Use Coroflot to post an online portfolio and find design jobs. ProfessionalOnTheWeb: ProfessionalOnTheWeb hosts a directory of portfolios. Make sure yours is there when clients search for help. Elance: Use Elance to get connected with clients that need your services on a project. 37signals Gig Board: Use the 37signals Gig Board to find freelance jobs in programming, design and more. WebProJobs: Find full-time and freelance web professional jobs on WebProJobs. Job Pile: Job Pile aggregates popular freelance job boards, so you can spend time working instead of searching. YouTube: Use YouTube’s viral video to get the word out about your creativity. CafePress: CafePress offers on-demand printing for promotional items as well as a place to sell your design. Spot Runner: Use Spot Runner to build a TV advertising campaign. Paperwork isn’t always fun, but it is necessary. Forms and agreements can provide legal protection and help you avoid disputes down the road. Check out these tools that help you protect yourself and spend less time on the boring stuff. MyNewCompany: Get legal and tax protection for your freelance business by making things official. Use MyNewCompany to incorporate or form an LLC online. Help Me Work: Get the stability of corporate life while still working as an independent consultant. Help Me Work takes care of taxes, client billing, paychecks, benefits, retirement plans and more. Designers Toolbox: Get set up with all the legal forms your design business may need with Designers Toolbox. Creative Commons: Use Creative Commons to specify how much or how little legal restrictions you want your work to carry. AIGA: Protect your business with AIGA’s standard form of agreement for design services. Nolo: If you’ve got a legal question about your business, head to Nolo. Experts there offer legal advice for independent contractors and consultants. Creative Public: Head to Creative Public for forms, contracts, pricing guides and more for your design business. Your clients are what keep you in business, so itâ€™s important to check in with them and make sure they’re satisfied. Use these programs to keep in touch with your clients and find out what they have to say about your work. Breeze: Send out email campaigns to your clients with Breeze’s easy tool. Wufoo: Use Woofoo to make forms, surveys and invitations for your customers with ease. Relenta CRM: Keep track of customer relationships using email, contact, document and activity management with Relenta. Highrise: Don’t lose track of your customers: keep in touch with Highrise’s online contact management system. ScratchnScribble: Use ScratchnScribble’s service to have handwritten or printed greeting cards sent to your clients. Clients are looking for your business online. Will you be there? Check out these applications to make sure your business has an excellent online presence. Big Cartel: Set up an online store to sell your products using Big Cartel’s service. WordPress: Blog about your business and industry with WordPress. Inblogit: If you’re a design professional, your blog should be attractive. Use Inblogit for blog functionality with more flexbility in design. Icebrrg: Create web forms with Icebrrg so that your website can generate customer inquiry and feedback. XHTMLized: If you’re too busy to build a website yourself, use XHTMLized. They take your design and turn it into a web page that is browser and search engine friendly. XHTMLiT: XHTMLit offers freelancers another time-saving solution for converting design into HTML. Userplane: Make your website interactive for your clients by bundling chat, messaging, video, search and live presence with Userplane. Ning: Let your clients network with each other by creating your own Ning social network. ExpressionEngine: Impress your customers by having a website with lots of features. Use ExpressionEngine to publish just about anything on your website. FlashDen: Build a great-looking website that your clients will want to visit. Buy Flash, audio, video and fonts to make your website look good at FlashDen. When your products look good, your business does too. Presentation makes a difference, so be sure to make a good impression by using these innovative printing and packaging tools. Jewelboxing: Impress your customers with Jewelboxing’s customized, professional-grade DVD and CD packages. Qoop: Qoop prints everything freelancers might need: business cards, apparel, promotional items, posters and more. Moo: Moo prints note cards and mini cards from your photos and design. These can be used for promotional materials or business cards. These tools pack a double-whammy of functionality. Use them to get the resources you need or as an alternative revenue stream. Google AdWords: Use Google AdWords to advertise your business or make money by putting AdWords on your website. Prosper: Using Prosper’s people-to-people lending website, you can borrow money for business expenses from real people. If you have extra cash, use Prosper to earn interest by lending to others. Text Link Ads: Generate interest in your website and attract clients with Text Link Ads or earn money by selling space for others on your site. PayPerPost: Use PayPerPost to have a blogger write about your product or service. Alternately, you can earn money by writing about someone else’s business. Guruza: Find answers to your business questions or earn money by giving expert advice on Guruza. From office suites to creative stimulation, these tools have a lot to offer for freelancers. Check out these applications that cover anything and everything else you might need for your business. Zoho: Zoho’s Office Suite includes a variety of software solutions for freelancers: a word processor, spreadsheet, presentation tool, wiki writer, notebook, project management, CRM solution, database creator, calendar, web conferencing, email and chat. Veetro: Veetro offers another all-in-one solution that specializes in the tools freelancers need the most. This program combines money, document, task and customer management with email marketing, reporting and blog publishing. Work: Are you clueless about what it takes to run a business in your industry? Work offers guides that show you how. Pandora: Get your creative juices flowing with Pandora’s fully customizable internet radio.